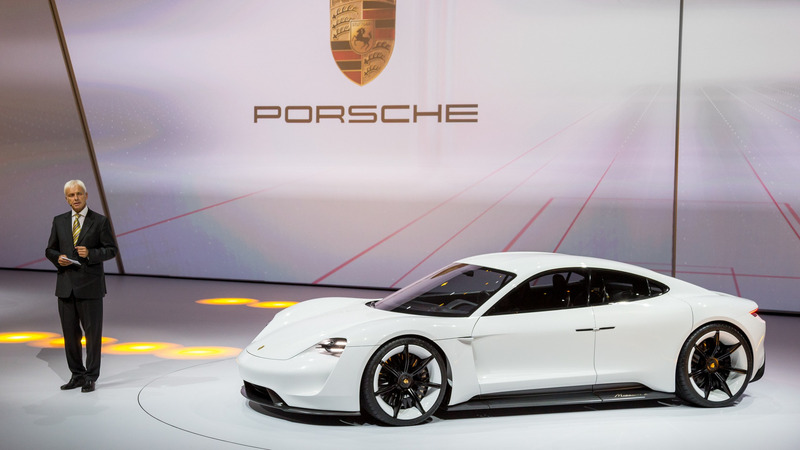 Porsche won applause when it confirmed plans to make the all-electric Mission E concept a reality. The Tesla-baiting sedan was so well-received by enthusiasts and would-be buyers that the German firm announced that not a lot will change as it transitions from a show car to a production model. Recent factory photos show a model very close to the concept in terms of design. Comments from members of Porsche’s top brass suggest it will hold its own in the performance and in-car technology departments, too. “The external design will be very similar,” Porsche CEO Oliver Blume told Top Gear. Of course, Porsche will have to make a few tweaks to get the Mission E to comply with safety regulations all around the world, so it won’t be exactly identical to the concept. In terms of size, the firm’s first battery-electric vehicle will be shorter and a little lower than the Panamera. Making it smaller will help the company avoid overlapping. The Mission E will offer a driving position similar to the one found in the 911, a so-called “hovering” center console, and an entirely digital instrument cluster. Porsche promises to give the two rear passengers what it calls a “foot garage,” a solution which clears up more space by making the foot wells markedly deeper than the rest of the floor. It will be practical, too, because it will offer a trunk on both ends. At launch, the Mission E lineup will include three models rated at 402, 536, and 670 horsepower, respectively. All-wheel drive will come standard, according to Automobile Magazine, and rear-wheel drive could be offered a little later in the production run. The list of extra-cost options will include a limited-slip rear differential. Anything is possible at this point with the not-insignificant exception of an internal combustion engine. The Mission E will be all-electric, all the time. It will perform the benchmark zero-to-60-mph sprint in under 3.5 seconds in its fastest configuration. Top speed will be electronically limited to 155 mph. The battery pack stuffed under the passenger compartment will store enough electricity for about 300 miles of real-world range, according to early estimates, and it will be compatible with Porsche’s novel 800-volt technology. Porsche is working with external suppliers like LG and Panasonic to develop the lithium-ion pack. “The past history [of LG and Panasonic] makes them battery experts, in particular when it comes to smartphones and their requirements,” Uwe Michael, the head of electrics/electronics development at Porsche, explained in an interview. The pack will be designed specifically for the Mission E. “The batteries have a major influence on driving dynamics, for example. Off-the-shelf procurement is simply not an option for Porsche,” he added. Looking ahead, the firm is spending its development dollars on solid-state batteries. It doesn’t expect the technology to be ready for series production until the late 2020s, though. Lithium-ion will be the standard chemistry in electric cars in the coming years. Unique on the market for the time being, the 800-volt charging system will give the battery an 80-percent charge (about 250 miles) in under 20 minutes — at least theoretically. Porsche predicts 800-volt technology will help make the E-Mission more convenient to drive while also making it more dynamic. It’s not just an electric car; it’s an electric Porsche. Porsche concedes that, while bringing an EV with an 800-volt charging system to the market is feasible, it’s a little bit useless unless there’s a vast network of 800-volt charging stations that it can be plugged into. Blume said Porsche is currently talking to government officials in Europe, the United States, and China about investing in 800-volt stations. For its part, Porsche is testing the technology in Berlin. Joe Lawrence, the chief operating office of Porsche’s North American division, told Digital Trends the company has already installed 800-volt chargers at its Atlanta, Georgia, headquarters. We can reveal inductive charging technology will be offered on the Mission E, too. Like most modern, high-end electric cars, the Mission E will be fully connected and come with some level of autonomy. Level five — full autonomy, where a driver isn’t required — isn’t a priority for Porsche, according to Michael. But, the sedan will offer driver-assistance systems (like InnoDrive) designed to take over in a traffic jam or on a long road trip, for example. Porsche is also investing in an over-the-air updating system it calls the “Car for Life” concept. In the not-too-distant future, it will be possible to update the infotainment system and many other systems at the push of a button. The driver could, conceivably, unlock more range. “Connectivity is certainly something customers are asking for. I think there’s also some degree of creative engineering going on to solve questions that may not yet even be in the minds of customers. That’s what innovation is about. That’s something we will continue to push forward,” Lawrence told Digital Trends. Camouflaged prototypes are already crisscrossing the globe. We expect the Porsche Mission E to make its public debut at a major auto show either late this year or in early 2019. If this prediction is accurate, the company’s first full-production electric model will arrive in showrooms in time for the 2020 model year. 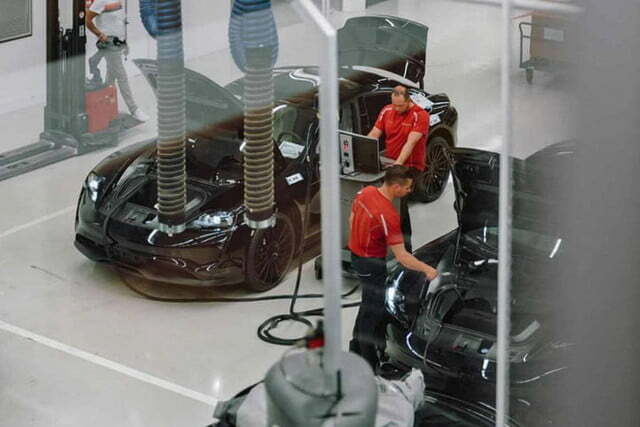 Porsche could later keep the momentum going — and leverage the benefits of economies of scale — by introducing at least one additional electric model. The Mission E’s platform (called J1 internally) won’t spawn an SUV, though. “Our target with the Mission E was to have a very sporty and low car. Using this platform for a high-floor car [like an SUV] would be tough. But if you talk about low-floor cars, something like the Cross Turismo, or if you talk about two-door cars, or if you talk about convertibles, the platform will be ready for that. You can modify the wheelbase to a certain extent without losing battery capacity. It’s very flexible,” Stefan Weckbach, the head of Porsche’s EV program, told Digital Trends in a round-table interview of the sidelines of the Geneva Auto Show. Weckbach candidly added the rugged-looking Mission E Cross Turismo concept introduced in Geneva remains a strong candidate for production, though it won’t arrive until a few years into the standard model’s production run. Production of both models will take place in a dedicated facility located on the outskirts of Stuttgart, Germany, the company’s hometown. In terms of pricing, the Mission E will slot between the Cayenne and the Panamera. It will carry a base price of about $75,000 before incentives are factored in. In other words, it will fight in exactly the same segment as the Tesla Model S. Though it hasn’t been unveiled yet, the sedan has already generated quite a buzz. “We talk to dealers and they tell us we can’t get it here soon enough,” Lawrence added. Asked if he’s concerned about customer acceptance, he answered some purists will howl at the idea of an electric Porsche but most will respond favorably. “I think of all the work we’ve done in terms of racing, and in the development of our production models moving towards electrification with the hybrids, with the 918. We’ve done a lot to prove to our customers that, yes, electric can be exciting, electric can be Porsche, and electric can even enhance the Porsche experience,” he said.